Abstract— This paper reports a new type of forced convection indirect type solar dryer setup fabricated in Nagpur, India and its performance was studied. The main objective of the present study was to incorporate new drying technology and develop a solar dryer that could function effectively for few more extra hours even after the sunset. Thus a forced convection indirect type solar dryer integrated with heat storage material (Gravel) & desiccant beds (Silica Gel) was developed. 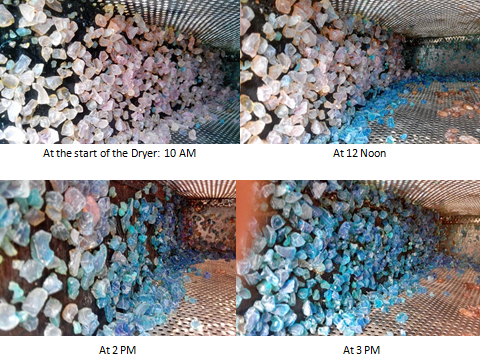 In forced convection solar dryer with heat storage material, the grapes were dried from an initial moisture content of 80% to the final moisture content of 20% in about 78 hours, while it took only about 57 hours in the forced convection solar dryer with heat storage and desiccant beds to reach the required moisture content. Due to the use of heat storage material, the temperatures inside the solar dryer remains 3-5°C higher than the ambient temperature even during off sunshine hours. Also, the heat storage regulates the temperature of the collector outlet during uneven climatic conditions. The maximum temperature attainedby air inside the dryer cabinet was 78°C. The desiccant beds can be regenerated in about 5 hours during a normal day and removes the moisture from the products even during the night. The air flow rate in both the cases was maintained at 0.026 kg/s. The quality of the grapes obtained from the solar dryer was excellent with proper coloring and taste as compared to those dried directly under the sun. Pallav Purohit, Atul Kumar, Tara Chandra Kandpal, 2006,“Solar drying vs. open sun drying: A framework for financial evaluation.” Solar Energy. 80: 1568-1579. Atul Sharma, C. R. Chen, Nguyen Vu Lan, 2009, “Solar-energy drying systems: A review.” Renewable and Sustainable Energy Reviews, 13: 1185-1210. A. Fudholi, K. Sopian, M. H. Ruslan, M. A. Alghoul, M.Y. Sulaiman, 2010, “Review of solar dryers for agricultural and marine products.” Renewable and Sustainable Energy Reviews. 14: 1-30. Ashish D. Chaudhari, and Sanjay P. Salve, 2014, "A Review of Solar Dryer Technologies." 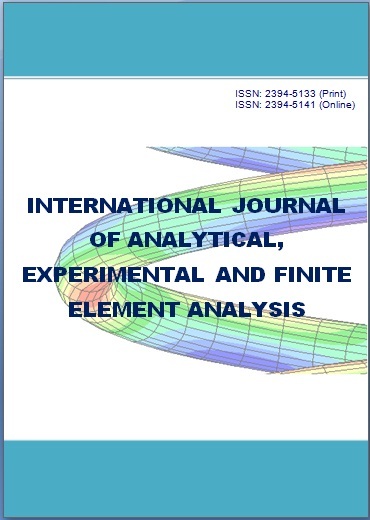 International Journal of Research in Advent Technology 22: 218-232. Gutti Babagana, Kiman Silas and B. G. Mustafa, 2012, “Design and Construction of Forced/Natural Convection Solar Vegetable Dryer with Heat Storage.” ARPN Journal of Engineering and Applied Sciences 7(10): 105-112. Lalit M. Bal, Santosh Satya, S.N. Naik, Venkatesh Meda, 2011, “Review of solar dryers with latent heat storage systems for agricultural products. Renewable and Sustainable Energy Reviews,” 15: 876-880. M. Mohanraj, P. Chandrasekar, 2009, “Performance of a forced convection solar drier integrated with gravel as heat storage material for chili drying, Journal of Engineering Science and Technology,” 4(3): 305-314. Hodali, Riyad, and Jacques Bougard, 2001, "Integration of a desiccant unit in crops solar drying installation: optimization by numerical simulation." Energy conversion and management 42(13): 1543-1558. V. Shanmugam, E. Natarajan, 2006, "Experimental investigation of forced convection and desiccant integrated solar dryer." Renewable Energy 31(8): 1239-1251. V. Shanmugam, and E. Natarajan, 2007, "Experimental study of regenerative desiccant integrated solar dryer with and without reflective mirror." Applied Thermal Engineering 27(8): 1543-1551. Wisut Chramsa-arda, Sirinuch Jindaruksab, Chatchai Sirisumpunwonga, Sorawit Sonsaree, 2013, “Performance evaluation of the desiccant bed solar dryer.” Energy Procedia. 34: 189-197. A. A. Hegazy, “Optimum channel geometry for solar air heaters of conventional design and constant flow operation, 1999” Energy Conversion and Management 40 757–774. A.A. El-Sebaii , S. Aboul-Enein, M.R.I. Ramadan, E. El-Bialy, 2007, “Year round performance of double pass solar air heater with packed bed”, Energy Conversion and Management 48: 990–1003.